Sheila Bowers has spent most of her career in adult education working with Fortune 500 companies. She has become an expert in facilitating classes for her clients to make complicated concepts easier to understand. Throughout the years, little did anyone know the complicated hair journey of weaves, frontals, relaxers, Keratin treatments and braids she embarked on to maintain her professional look. Then, like so many of us today, she faced a receding hair line and damaged, aging hair. 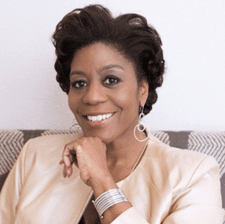 By marrying her entrepreneurial spirit and seeking more natural solutions for her own hair care Sheila launched gMyHair when she discovered the MONAT hair care line. gMyHair is truly a movement for her; within two weeks of using the MONAT flagship product “Rejuveniqe Oil Intensive” she saw significant hair growth. By becoming a distributer of MONAT she now educates adults about having a great hair day, every day. Regardless of age, ethnicity or hair type, by choosing the right products for them to get the results they want; she became compelled to begin a hair revolution. This is a life changing product line that focuses on cruelty free, vegan, naturally based and scientifically researched formulas that put the ‘care’ back into hair care. The results speak for themselves.